The below form is in PDF format and may be opened by double clicking anywhere in the form. The form will then be opened in a separate window, which you can print and complete at your leisure. When completed please forward the form to our email or fax addresses listed on our Contact Page. 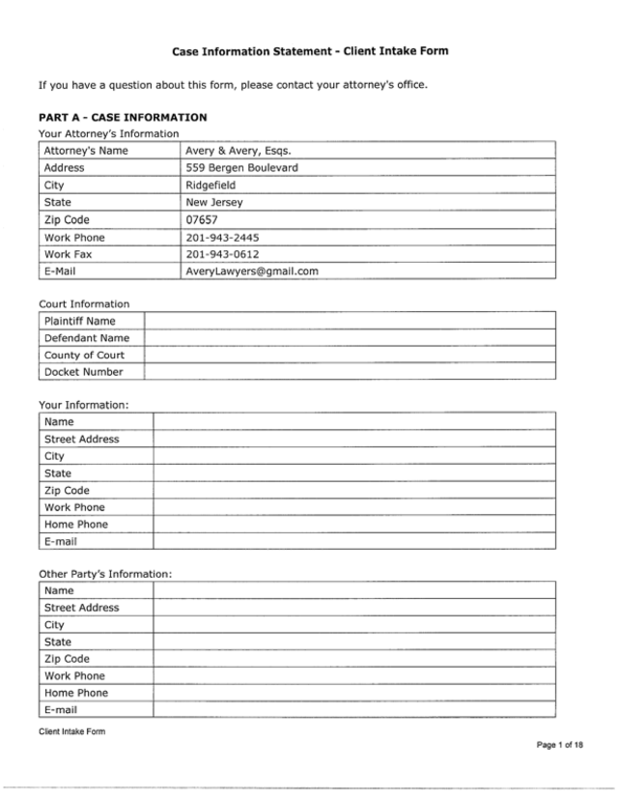 This form serves as the basis for our analysis of your Matrimonial / Custody / Support matter and as the basis for completion of the Case Information Statement which is a document required by New Jersey Court Rules to be filed with the Court in every Matrimonial / Custody / Support case filed in the State of New Jersey. Having this information available at or prior to your first consultation with us will help us properly analyze the matter and advise you as to the proper course of action.